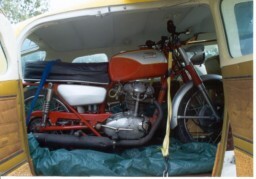 We bought this restored 1965 Ducati250cc motorcylce because it fit in the plane. By removing the rear aircraft seats and placing thin plywood on the floor, we created a space that could easily hold the motorcycle and all of our gear. It was also large enough to sleep comforably inside. The tie down straps held it very securely (in case of turbulence) and no adjustments were needed for the two of us to quickly remove it from the plane or load it back in when we were done. 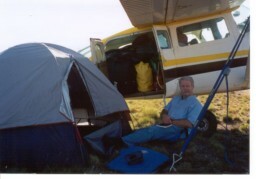 This home made screened porch slid over the wing then attached against the large cargo doors with Thule straps, protecting us from insects or small animals, with convenient access to the inside of the plane. 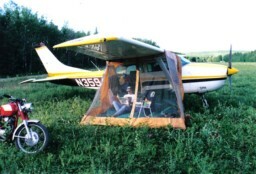 In cases of heavy rain, an additional tarp could be draped over the entire wing. 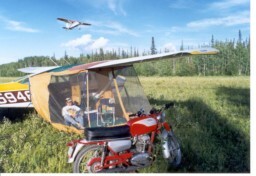 There were many occasions that we would just leave the motorcycle in the plane and pitch the tent along side. In Alaska we were welcomed to camp at virtually every airport, some with spectacular scenery, and most with clean bathrooms and even showers. 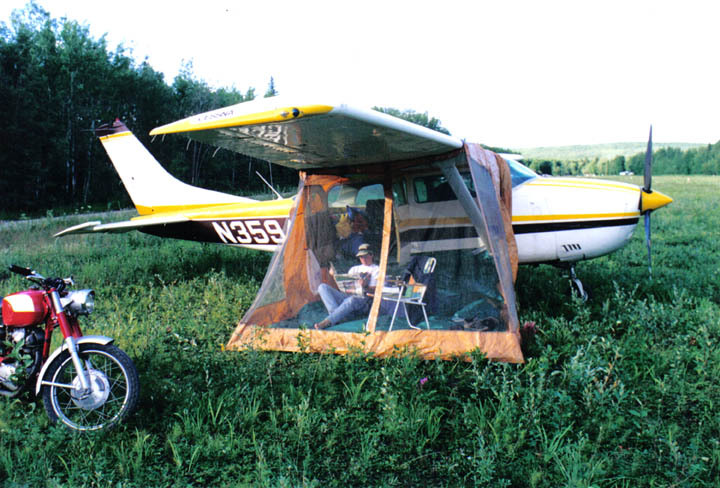 We travelled to a few campgrounds, but found it easier to just camp by the plane. A surprise bonus was the ability to sleep in the plane. 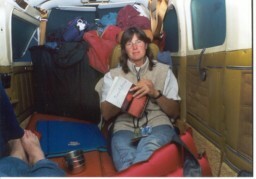 All of the gear was packed forward on the pilot and passenger seats and rearward in a baggage compartment, and foam air mattresses were put on the floor. The motorcycle was parked under the wing with a tarp over it. In addition to keeping us dry and up off the ground, the plane afforded at least some level of protection from grizzly bears. The only downside was wind. Despite being tied down the plane was capable of considerable shaking during wind storms.